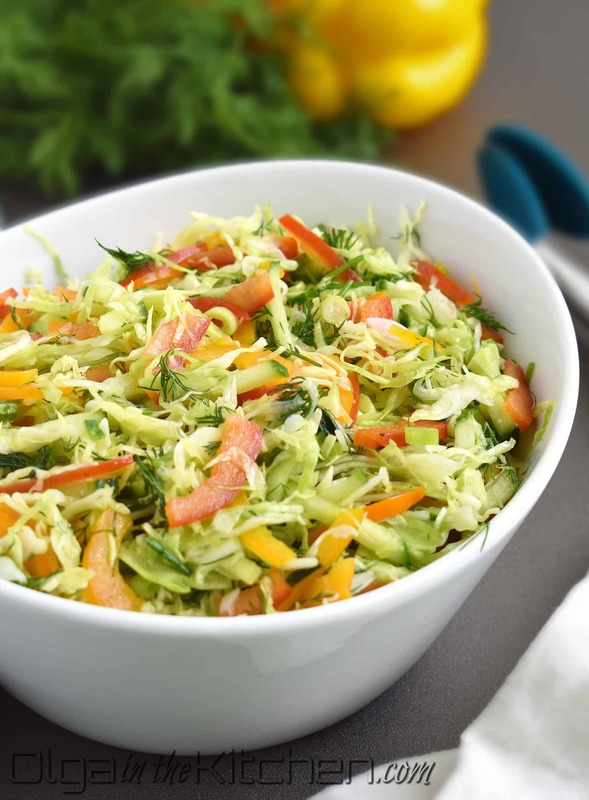 Cabbage Pepper Salad: easy to make, simple ingredients, very healthy and super delicious! 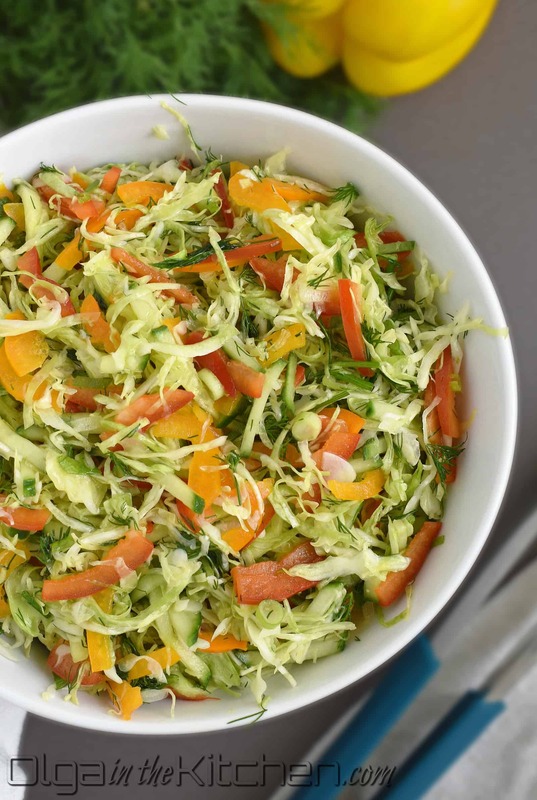 This salad is great to make the day before the big party. 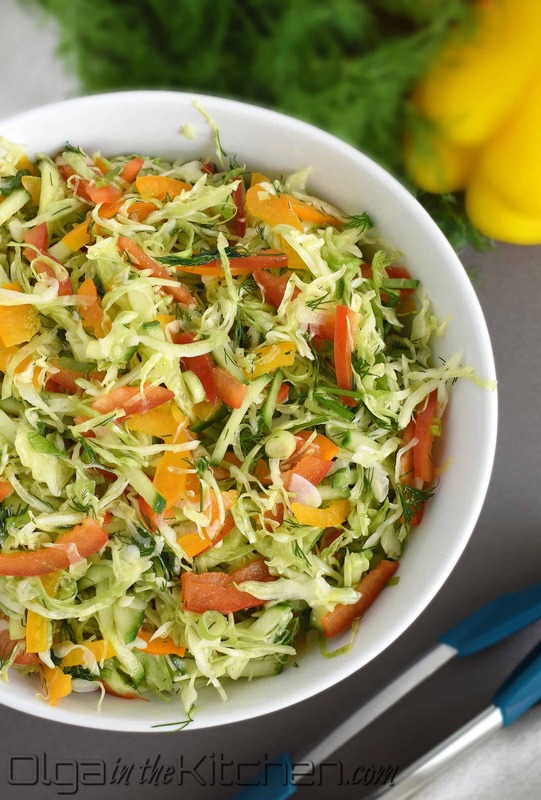 Cabbage Pepper Salad literally takes less than 20 minutes to make. I would recommend using the Benriner Mandolin; it would make everything a lot easier, faster and your salad will look elegant and neat. The ingredients needed are very general and most likely you already have them in your fridge. 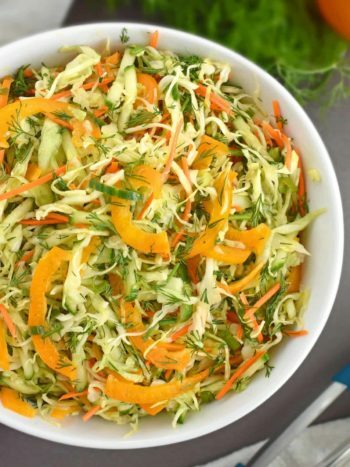 This salad was invented from the Cabbage Carrot Pepper Salad. Both of these salads are very popular at our home. Sometimes I prepare this salad as a ‘spur of the moment’, but most times I make it the day ahead of any gathering. It actually tastes better next day once all the veggies are fully marinated with the dressing. This salad would be perfect for Christmas! 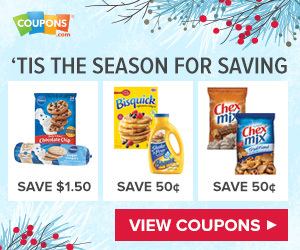 The beautiful Christmas colors and quick preparation is all you need to make your holiday menu easy and delicious. Always stir, taste and add salt if necessary just before serving. 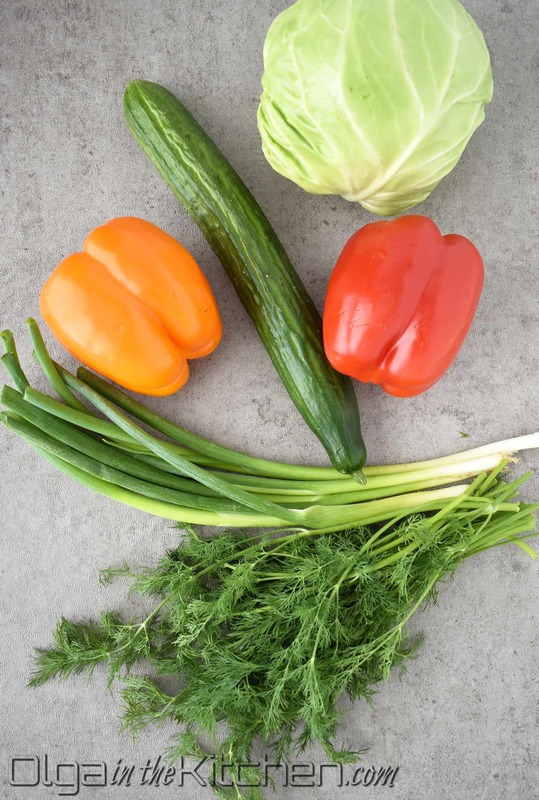 Leftover salad can be refrigerated and delicious up to 3 days in refrigerator. Wash and paper towel pat dry your veggies. 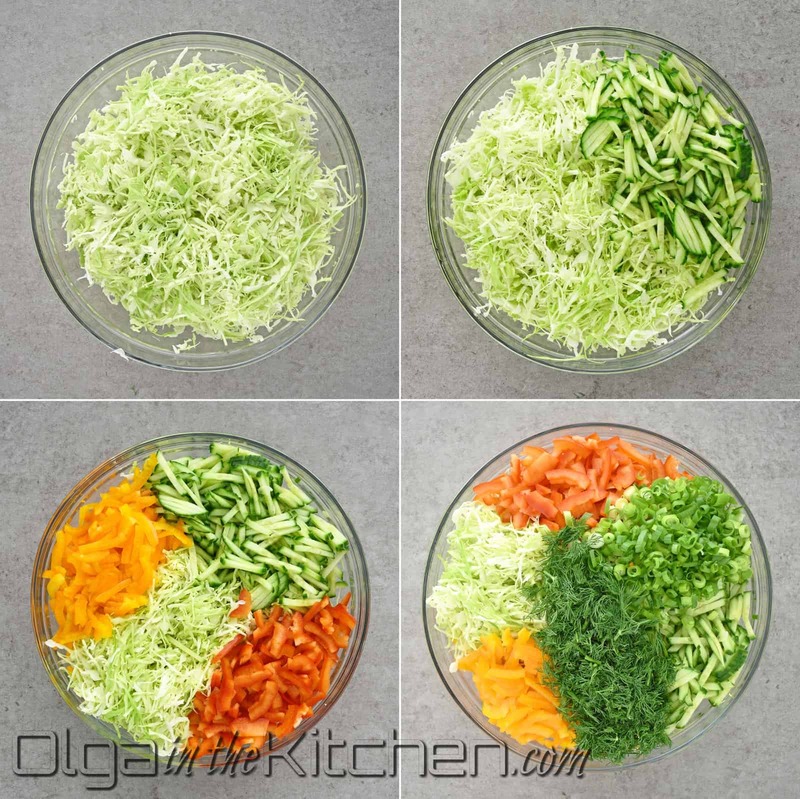 Into a large bowl, thinly shred 1 green cabbage onto benriner mandolin (adjust to 1-2mm thickness). 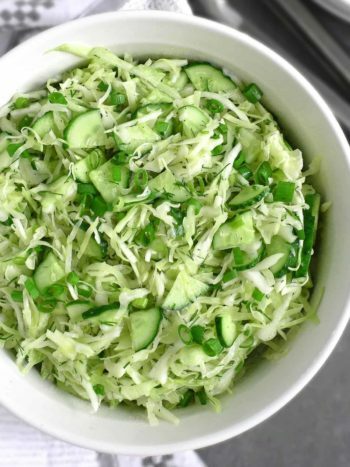 Insert coarse blade into the mandolin and slice 1 English cucumber into the bowl with cabbage (remove coarse blade once done). 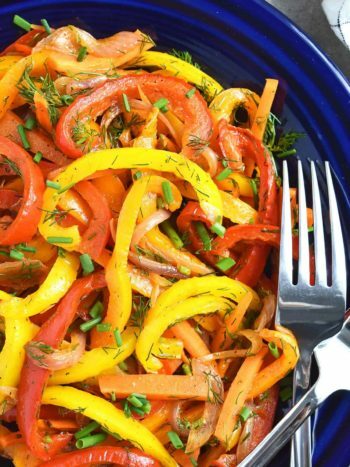 Cut 1 orange bell pepper and 1 red bell pepper into 8 wedges, remove the seeds and slice onto the mandolin. Finely chop 1 bunch green onions and 1 bunch dill; add the herbs to the salad. 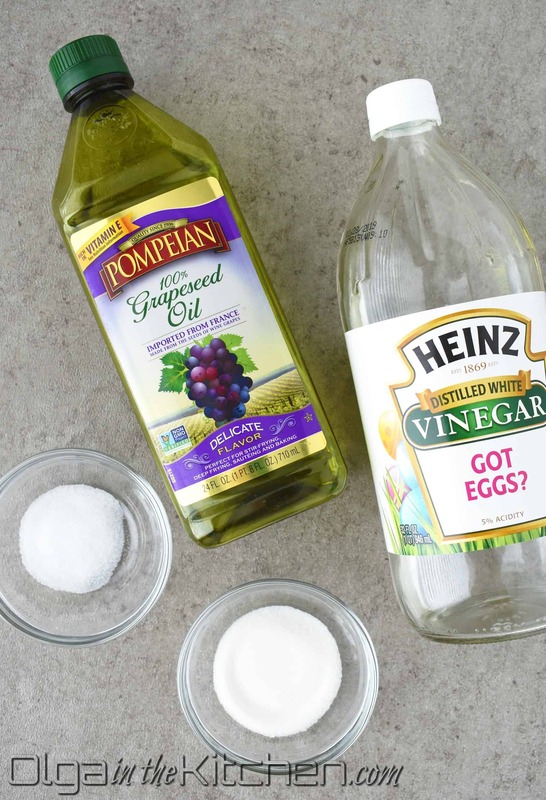 In a small bowl, combine and whisk 1/2 cup grapeseed oil, 1/4 cup distilled white vinegar, 1 tbsp sugar and 1 tsp fine salt. Let it sit for 5-10 mins in order for sugar and salt to dissolve a bit. 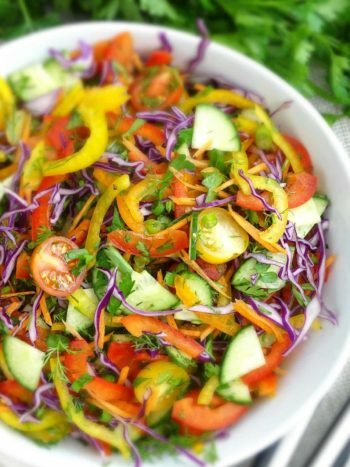 Pour the dressing over the salad and give the salad a good stir in order for dressing to fully cover all the veggies. Refrigerate salad for at least 2 hours before serving. Stir, taste and add salt if necessary before serving. 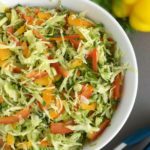 Cabbage Pepper Salad: easy to make, simple ingredients, very healthy and super delicious! 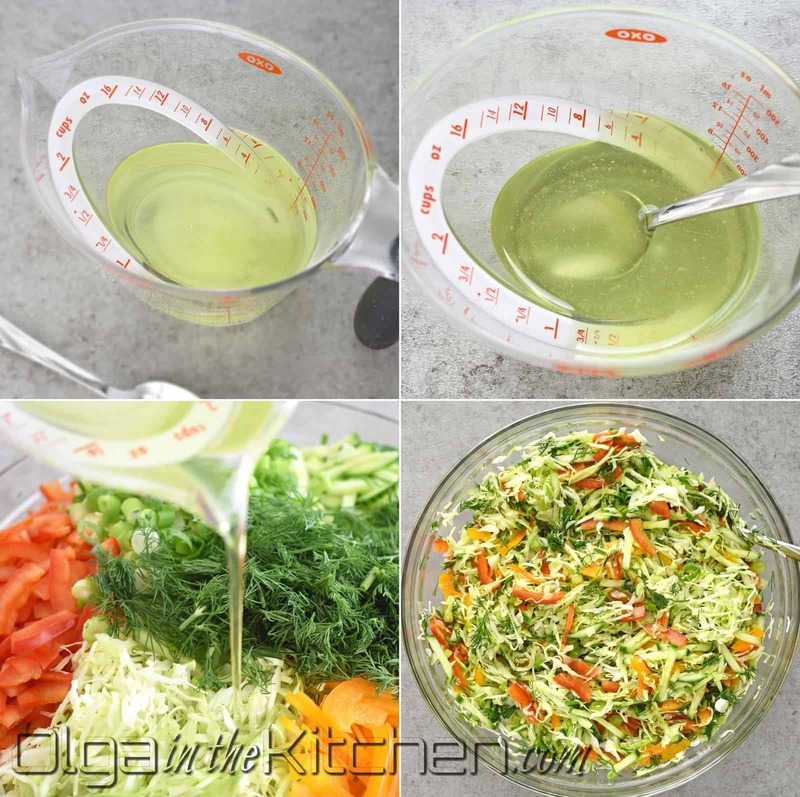 To Make the Dressing: In a small bowl, combine and whisk 1/2 cup grapeseed oil, 1/4 cup distilled white vinegar, 1 tbsp sugar and 1 tsp fine salt. Let it sit for 5-10 mins in order for sugar and salt to dissolve a bit. Pour the dressing over the salad and give the salad a good stir in order for dressing to fully cover all the veggies. Refrigerate salad for at least 2 hours before serving. Stir, taste and add salt if necessary before serving. Fantastic! Made this for lunch today. Will keep it in my recipe book.